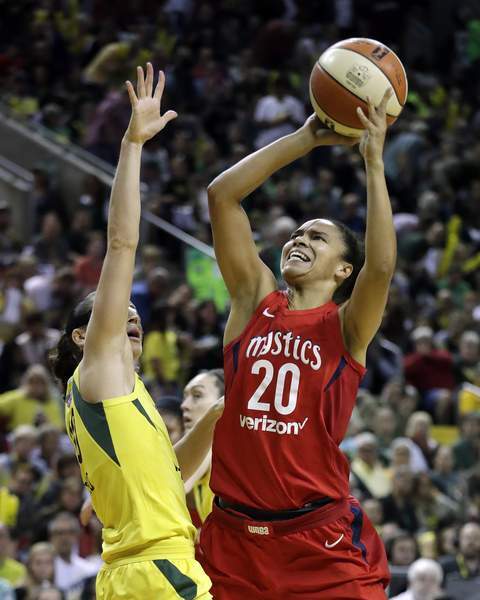 Associated Press Washington Mystics' Kristi Toliver (20) shoots over Seattle Storm's Sue Bird in the first half of Game 2 of the WNBA basketball finals Sunday, in Seattle. SEATTLE – Breanna Stewart scored nine of her 25 points in the fourth quarter, and the Seattle Storm held off the Washington Mystics 75-73 on Sunday to take a 2-0 lead in the WNBA Finals. Seattle has won seven straight Finals games dating to 2004. They have never lost a Finals game at home. ... It was the first time this season Washington failed to make a 3-pointer. ... Bird had 8 points on 3 of 12 shooting.